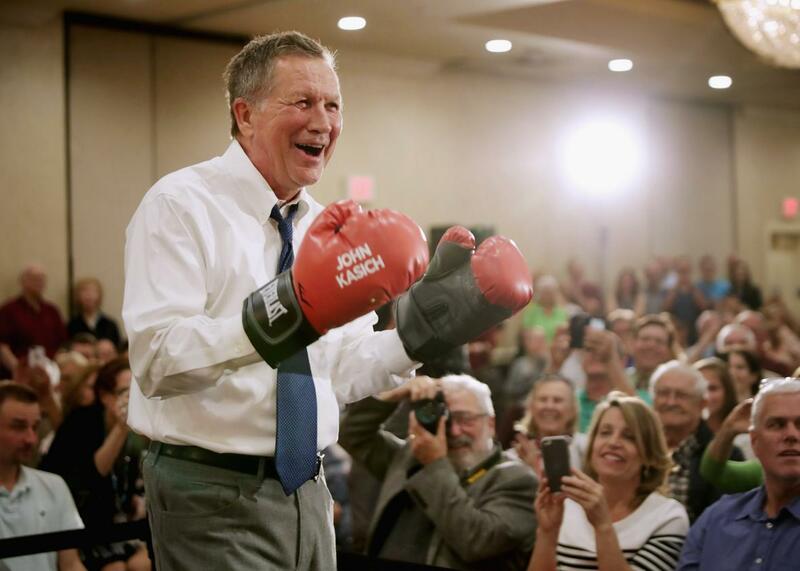 John Kasich puts on a pair of boxing gloves given to him by a supporter during a campaign town hall meeting in the ballroom at a Crowne Plaza hotel April 19 in Annapolis, Maryland. A few important caveats: This particular leak is coming from Team Kasich, which is not on the best terms with Team Trump at this particular moment. Meanwhile, the story could be true in a narrow sense (Donald Jr. really did actually say that) without being true in a larger one (this was the deal that was really on the table). The Trump camp has shown time and time again that the entire team is rarely on the same page and—even if they were in this case—it’s possible that this was a promise Trump never planned to deliver on, or, alternatively, that he’d simply change his mind sometime after November. And yet! This isn’t the first time someone close to Trump has suggested that the GOP nominee would effectively outsource the day-to-day job of actually being president of the United State of America. Here, for instance, is how campaign chief Paul Manafort discussed his boss’s VP desires in a Huffington Post interview back in May: “He needs an experienced person to do the part of the job he doesn’t want to do. He sees himself more as the chairman of the board, than even the CEO, let alone the COO.” And there’s also the not-so-small matter that, setting aside the power and the prestige of the title, the day-to-day job of being president doesn’t sound like one Donald Trump would actually want. Still, even if we take the suggestion that Trump’s VP would be doing all the work at face value, that’s not a reason to exhale—and not just because in this case that VP would be a man who believes smoking doesn’t kill because not everyone who smokes a cigarette drops dead. A President Trump would still be a President Trump, able to wreak havoc and impose his dangerous worldview on the world while still avoiding the daily grind of being commander in chief.